Also, why was my LastPass passwords account (ie, where I store my passwords), merged with my LastPass FORUM user account? I don't remember agreeing to this. erikfelt Wrote: Also, why was my LastPass passwords account (ie, where I store my passwords), merged with my LastPass FORUM user account? I don't remember agreeing to this. It's single sign on. Your LastPass session authenticates you. A forum password is no longer required. I've just cancelled my automatic renewal. After being a premium subscriber for years, I find that the value of subscribing has diminished while the cost has increased. The failure to even repair a gross defect in this forum is an example of how Lastpass has begun a slow slide down the toilet bowl under LogMeIn. Sorry, Lastpass, you're no longer a leader in this niche. Here we are, almost 1 year after MENtuartiF's last post, and the Profile page still shows a 500 error. I don't believe LastPass (the company) really cares about this forum. And while some user above said that PhpBB and LastPass are different pieces of software, this forum lives under the .lastpass.com domain and is devoted to support & feedback for LastPass's main product. I made a small mistake when typing my username, and ran into the 500 error while trying to fix it. But now I feel I make an even bigger mistake by using LastPass at all. I'm forced to use it at my workplace, but I'm taking all my data from my personal account. ateijleo Wrote: Here we are, almost 1 year after MENtuartiF's last post, and the Profile page still shows a 500 error. 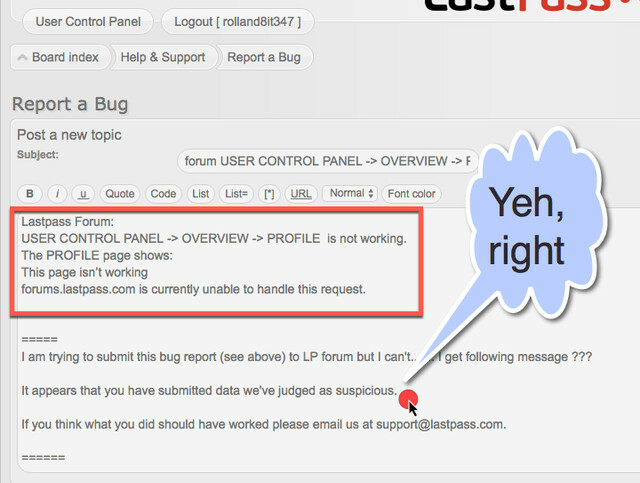 I don't believe LastPass (the company) really cares about this forum. And while some user above said that PhpBB and LastPass are different pieces of software, this forum lives under the .lastpass.com domain and is devoted to support & feedback for LastPass's main product. I made a small mistake when typing my username, and ran into the 500 error while trying to fix it. But now I feel I make an even bigger mistake by using LastPass at all. I'm forced to use it at my workplace, but I'm taking all my data from my personal account. I get the same error. I would like to my profile name, etc. but cannot access profile page. Trying to report this bug but it doesn't allow me to.